QGIS based solution for Telecom Operators. Manage your network and Streamline network processes. The European Digital Agenda, developed by the European Commission, assumes in its program, inter alia, a provision of access to high-speed Internet for the citizens of Europe. This imposed on individual Member States of the European Union an obligation to provide the access to broadband connection for every household by 2020. Owing to this initiative and financial support of the EU funds many local operators have received a chance to develop their network on which they will be able to provide new services. Meeting the needs of telecommunication entrepreneurs, we offer a software that is designed to support their activities both at the stage of their FTTX / FTTH network planning, as well as during further works related to full preparation of investments, implementation and subsequent maintenance thereof. 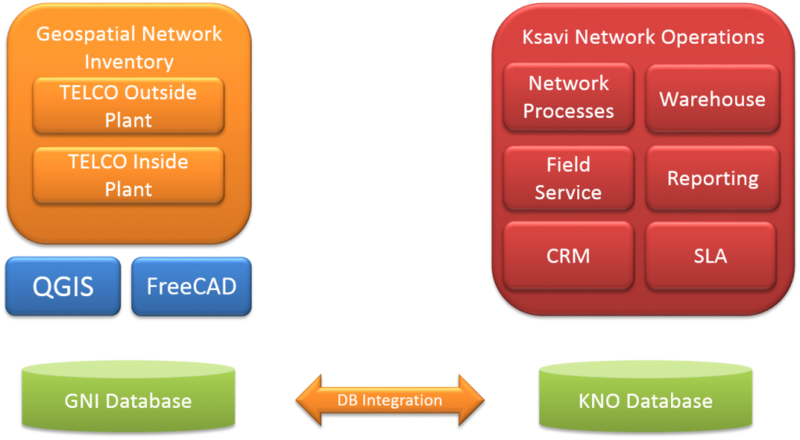 Overall solutions consist of two products Geospatial Network Inventory and Ksavi Network Operations offering full features of a professional inventory system and network operation support services. Using free and open-source GIS (QGIS) and CAD (FreeCAD) software we developed a solution that while maintaining its functionality, will compete in price with other commercial products of this class.